Sathya Sai Baba made many predictions in private interview situations, wjhere it was taboo to repeat to others afterwards, but SB knew well that they would spread like wildfire as uncontrollable rumours. When the predictions failed, which they invariably did, there was no documentary proof that he made them, and devotees dare not confront him or what he says in any way. The same with many of the alleged 'leelas' and 'divine miracles'; they were very important to the Sai Baba legend and were mixed up with disinformation, a clever technique at which Sathya Sai Baba was an adept at using his willing but unwitting collaborators to propagate. Now that 2008 has long passed, international war continues in Afghanistan, while an horrific relentless war rages in Syria, with proven covert intervention from Iran and Lebanon and occasional pinpoint attacks from Israel. A brutal civil war backed by NATO in Libya raged for 8 months and in 2014 began again with ISIS. Outright war also occurred in Russia's invasion of Georgia in South Ossetia, which Russia still occupies. One may also point to several major civil wars in recent times, such as in Dafur, Indonesia, and currently in the Congo area and in diverse warring conflicts in African states. The so-called 'war on terror' is also being actively pursued and the US Congress is to pass a law defining cyber attacks as war, giving the right to respond militarily. Disinformation: "It involves the deliberate, calculated dissemination of equivocal data, partially true, partially erroneous, in order to conceal something, to deflect attention in one or another peripheral or tangential direction. But the best lies are always embellishments or variations of the truth, not total fabrications. The most effective disinformation is always structured around a core of validity." (from The Messianic Legacy by Baigent, Leigh & Lincoln London 1968) Sathya Sai Baba claimed he was the Director behind the scenes of all that happens on the world stage and often stated that events that are inexplicable - or seem evil to us - are all part of his 'maya' (i.e deceptive appearances), 'his Divine sport' (i.e. leela). This level of disinformation surely surpasses anything the biggest propaganda agencies of the last century have produced. It would be amazingly inexplicable that about 7 Indian Prime Ministers and 5 Presidents have endorsed this charlatan Godhead, were it not for the obvious fact that they have seen his influence as important for their electorate in Andhra Pradesh and subsequently other Indian states and also because he was the biggest foreign currency earner in India for decades. That the Sathya Sai Central Trust was granted total freedom from customs and excise duties and taxation. Even now can avoid making more than the most superficial of accounts of its countless transactions public, and never published meeting minutes (if it even takes them). One can have no doubt this made it an Eldorado for money launderers and corrupt politicians, though its secrecy is so tight that this cannot be proven or even investigated. All incipient courty actions against it simply disappeared without public announcement, which is a clear sign of bribery! Note that the importance for the Indian economy of payments to the funds of gurus with followings outside the country has been essential, and has been a main source of foreign earnings, which is why so few of them charged with criminal offences have every been convicted. Sathya Sai Baba as world saviour Well-known proclamations by Sathya Sai Baba are quoted on how he intends to save the planet and humanity... as well as some of his more incredible prophecies which have so far not come to pass. 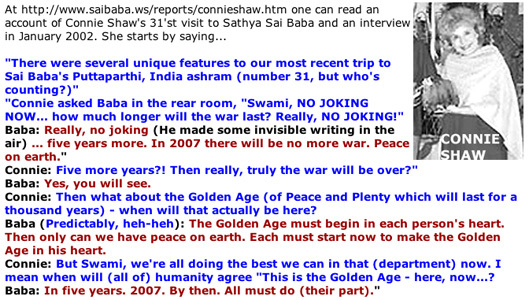 Prophecies about Sathya Sai Baba in the Suka Nadi etc. Each prophecy is considered for its likelihood of having been made and its validity Bogus Prophecies about Sathya Sai Baba Sai Baba soon to fly unaided in the sky? Sai Baba prophesies he will lift "a whole range of mountains"! The Pope to preach Sai Baba's message?